This has been somewhat useful in Silence Priest for me, which itself is a questionable archetype. Though it doesn't play nice with minion-based silences, which makes it feel a bit inconsistent. With ancient shade, this card is true garbage. Rather have a 7/4 for 4 mana and take 7 to the face than be completely thrown off curve. 2 health is the difference between pulling a fireball or a flame cannon. I always heard his summon quote as "Y-Y-You gotta be kitten me!" which suddenly makes him seem a lot less threatening. One of the best pally counter, plays Peacekeeper on him, leave it there so your enemy can't summon high mana legendary and for lulz..
Until this day I see Iron Man in this card. At first I saw this card and thought: this was awful, but now...I really like it. There's a big difference between 5 mana and 6 mana and having 7 attack makes this a minion your enemy can't afford to let live, else he'll take significant losses.....So you won't be hurt at all from using it. Unless you're against Paladins. Quite a tricky card in the ARENA. It's both hard to play and hard to play against. Plays it when you can control precisely the time this little fellow dies, so that you pay as little penalty as possible, most favourably that it's traded by a heavy removal. 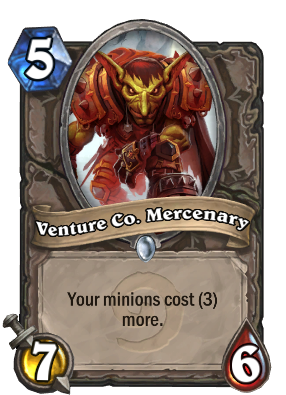 It's hard counters are freeze effect, Humility of Paladin, Big Game Hunter and taunt minions with low attack that forbid you to get rid of it soon enough. Really good arena card, but beware playing it against paladins when u have high ammount of wins.